Determine and Focus on Your "WHY"
Most people don't have a reason for wanting to lose weight or get in shape other than they just know they need to. Maybe a doctor told them they needed to or it's just a personal understanding based on an area they are unhappy with in their life. Here's the thing, just saying you want to lose weight and/or get in shape doesn't give you anything specific to aim for or anchor you through the process. This mindset is too general and too vague to provide the mental resilience necessary to see things through. In addition, if simply losing weight and getting in shape (which is subjective) is your primary reason for your new diet or exercise plan, what happens when you reach that goal? You only need to lose so much weight (if any) and you'll eventually be in better physical condition; so what happens then? If you don't have something beyond the general sense of weight and better physical condition then what's going to drive and direct you at that point? What's needed is a specific purpose as to why you are going to pursue this new goal. Knowing you want to "lose weight" and "get in shape" doesn't help you focus on WHY you need to do it. Yes you want to be healthier, but beyond that what will doing so provide you; what will it change in your life; what deeper need will be met; how will it make a difference? Take time to dig deeper and think about it. Will reaching this goal give you more energy so you just feel better every day? Will it allow you to be more active in life and not miss out on opportunities that you currently have to let pass you by? Will it improve your relationships because your personal mindset will be more positive? Will it allow you to enjoy life more? Will it allow you to give more to the people and things that truly matter to you? Find your anchor and focus on that when you set out on the journey to healthier living. And make no mistake, it is a journey. It's going to be filled with ups and downs, success and setbacks, curves and roadblocks; and that's when it's going to be vital that you have something keeping you grounded and moving forward and refusing to pack it in and go back to where you were. Never allow yourself to be resigned to living a life that's less than your capable of. You weren't created to live each day sad and downcast about how you feel, how you look, and what you're unable to do. Determine your WHY, set your intention, focus your efforts, and get to work. 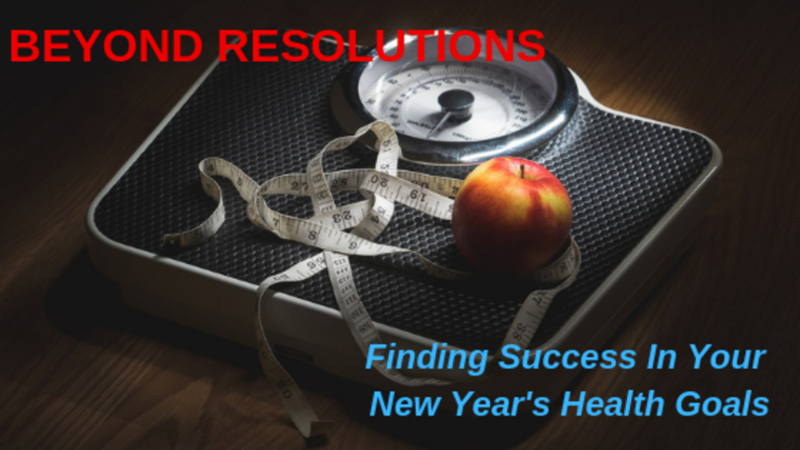 One of the chief reasons people give up so easily on their new year's resolutions is that they have misguided expectations. In a sense, the expectations are too general and fall short of the reality of the time it takes to see change and develop the habits necessary to create a new lifestyle. Our culture is one in which we are constantly bombarded with the best possible version of people's lives, so now more than ever it's easy to fall into the comparison trap. We see how other people look or the results they attained and in our minds we think that's what we need to aim for. Far too many people have unrealistic expectations and unfortunately this lends itself to them becoming discouraged, feeling like a failure, and ready to give up on the changes they were so excited to pursue just a short time before. Here are some things to consider. 1) When you see someone on a magazine or social media that looks a certain way and it's because they ate this or exercised like that, the truth is that they worked long and hard to be ready for that photo. Very few human beings walk around 24/7 ready for a photo shoot and none of them walk around with the airbrushed version of themselves to show off. When you see people sharing results from a diet or program, it took consistent work over an extended period of time to get to that point. AND, maybe their results don't need to be your results. Maybe you need to exercise for better overall health and daily movement, not to bench press twice your bodyweight or have a ripped 6-pack. Maybe that super restrictive diet isn't what your body needs or will even respond to. You have to determine the realistic and applicable goals for your body and your life. Then you can start to weed through all the options to determine what may be the best way for you to pursue a healthier lifestyle and what you can actually expect during the process. There is no magic bullet in nutrition and exercise that works for every single person. Your biology is unique to you. Don't fall prey to hype. Don't fall into the trap of expecting overnight results. And don't be led astray by the illusion that any real change can occur without putting in the work and doing so consistently. Truly healthy change takes time, so you must prepare yourself mentally and emotionally for challenges, setbacks, and in many cases the need to make adjustments to your plan. When you get ready to start getting after your new year's resolutions, don't be random and haphazard. Don't just say, "hey, that diet plan looks good. I see it all over the place. Everyone seems to be getting fantastic results from it so I should try it." Do some research to learn more about the details and be honest in your assessment of whether or not it's something that will work for your budget and your schedule. Plan how it will look in your daily life. Don't go into the gym and do random stuff. Yes something is better than nothing, but without some sort of plan or idea about where you want to go and how you're going to get there you'll just end up doing a lot of things that ultimately don't necessarily work together to give you results. If you are unsure of how or what to do, find someone to give you some direction. Find someone or something that at least gives you some sort of structured plan where you know what you need to do and why you need to do it. This is where working with a trainer or coach, even to assess what may be right for you, can make the difference. Focused, intentional work will always win out or random, ambiguous effort. Whether you're looking to start eating differently or start exercising regularly, don't go for too much too quickly. Start small and work your way into loftier endeavors. When you start trying to eat healthier, don't assume you need to go cold turkey on everything that doesn't fit what you want your new nutrition lifestyle to look like. Begin with picking one or two items to deal with. Spend time becoming consistent with a few things before you take on a lot of things. Restricting or adding too much too soon most often leads to overwhelm and/or feeling deprived and neither of those emotions is going to be an asset for staying the course and continuing with your healthy changes. The same principle applies with your fitness. Don't feel like you need to go for a 45 or 60-minute hard-core workout right out of the gate. Understand that your body needs time to adapt and prepare itself for what should be progressively intense loads, not an avalanche that makes your feel beaten up and unable to come back and give your best for another day. Make sure your training and nutrition align with your goal and begin focusing on the easy, doable steps that over time will lead you on to greater and more impactful actions. I've previously made note that realistic expectations are important. Well, you need to understand this simple fact. Truly being healthy and fit requires a lifestyle mindset, not a short-term fix mindset. To get results requires hard work. Why work hard, stop the actions that have gotten your results, go back to what you were doing (or not doing) before, and then have to start all over again? Lifestyle habits are what you need to cultivate. When you change something nutritionally, have the mindset that you're creating a new normal. It's not a short-term guideline to be survived, it's a new way of living intentionally to help you feel your best and live your best. Similarly, there's no exercise you can do, then stop, and expect the progress to stick. To legitimately get in shape and then be physically healthy you have to build a consistent routine that keeps you working your body in new, challenging ways. Small tweaks are all you need to mix it up, but consistently investing in your physical health is a non-negotiable for being your best day in and day out. Lifestyle isn't for 3 months, 6 months, or even a year. Lifestyle is just that, a way you build healthier habits of doing things for the rest of your life. When you think about what you want to differently in the new year, give some time thinking about these things. And don't assume you have to do it alone. If you don't yet have the mental and emotional strength to stay committed without accountability, find a friend or group of friends that will hold you accountable. Find a friend who has the same or similar goals as you and commit to working on your new, healthier lifestyle habits together. Find a community of supportive people who all want to be their best and are excited about helping you be your best. Invest in and enlist the assistance of a professional who can help you determine what may be best for you and how to do it. Find that person who can provide you the framework and structure that puts you on the path to reaching your goals. No doubt you still have to do the work. Your health is your responsibility. However, that doesn't mean you have to or need to do it alone. Surround yourself with a tribe of people who will support and challenge you to be your best and who you'll do the same for in return. Get your mind ready. Rise above the hype. Determine that you will not compare yourself others. Start with small challenges that are doable but still require you to put intentional effort in. Know where you want to go and how what you're doing will help get you there. Find that group of people who are like-minded in moving their life forward. Spend less time with those who pull you back toward where you began. Your healthier, happier life is ready and waiting for you to get on board and start moving in a new direction. Can't never could so believe that you have the ability to find success even when you find that you need to change the process. Change is how we grow and become the next, best version of ourselves. Never give up the adventure of pursuing your best self. I'll see you on the journey!